A photo of my 19 week belly by Weretoad, 2013. Baby’s sun sign will be Cancer, so we’re really into crabby things. 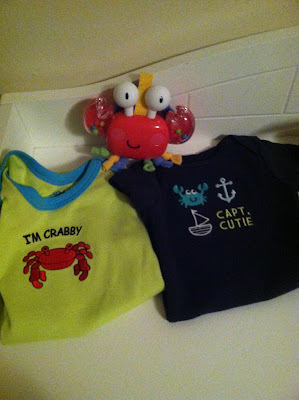 Mum and Dad have treated our little one to these adorable crab clothes and a rattle! Photo by Grey Catsidhe, 2013.